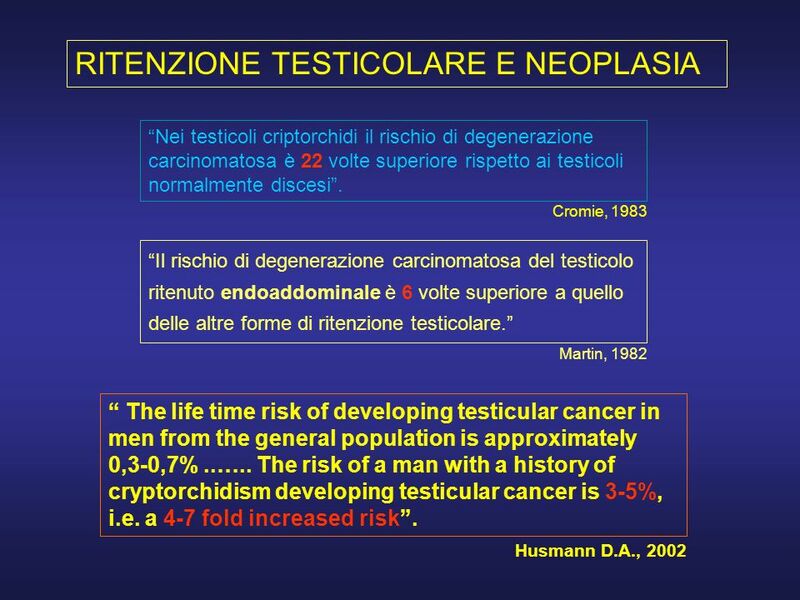 Lanciano 25.11.2006 ANOMALIE DI DISCESA DEL TESTICOLO TESTICOLO CATTEDRA DI CHIRURGIA PEDIATRICA UNIVERSITA DEGLI STUDI G. DANNUNZIO CHIETI-PESCARA N.
10 ANOMALIE DI DISCESA DEL TESTICOLO QUALE TRATTAMENTO ? 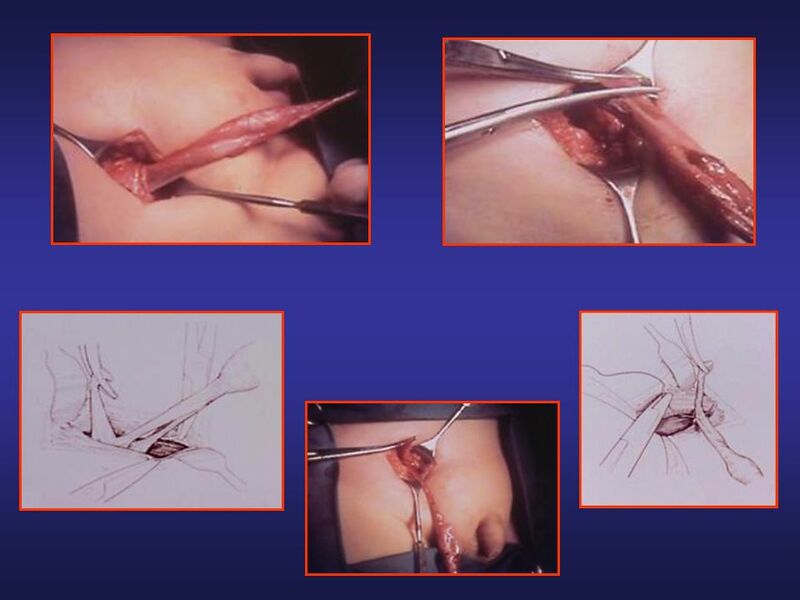 12 Pediatr Surg Int. 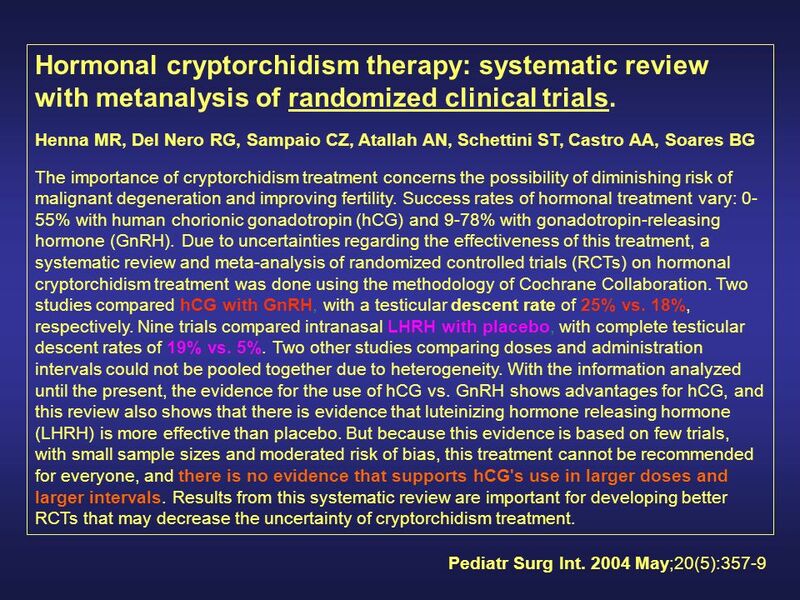 2004 May;20(5):357-9 Hormonal cryptorchidism therapy: systematic review with metanalysis of randomized clinical trials. Henna MR, Del Nero RG, Sampaio CZ, Atallah AN, Schettini ST, Castro AA, Soares BG The importance of cryptorchidism treatment concerns the possibility of diminishing risk of malignant degeneration and improving fertility. Success rates of hormonal treatment vary: 0- 55% with human chorionic gonadotropin (hCG) and 9-78% with gonadotropin-releasing hormone (GnRH).  Due to uncertainties regarding the effectiveness of this treatment, a systematic review and meta-analysis of randomized controlled trials (RCTs) on hormonal cryptorchidism treatment was done using the methodology of Cochrane Collaboration. Two studies compared hCG with GnRH, with a testicular descent rate of 25% vs. 18%, respectively. Nine trials compared intranasal LHRH with placebo, with complete testicular descent rates of 19% vs. 5%. Two other studies comparing doses and administration intervals could not be pooled together due to heterogeneity. With the information analyzed until the present, the evidence for the use of hCG vs. GnRH shows advantages for hCG, and this review also shows that there is evidence that luteinizing hormone releasing hormone (LHRH) is more effective than placebo. But because this evidence is based on few trials, with small sample sizes and moderated risk of bias, this treatment cannot be recommended for everyone, and there is no evidence that supports hCG's use in larger doses and larger intervals. Results from this systematic review are important for developing better RCTs that may decrease the uncertainty of cryptorchidism treatment. 13 J Urol. 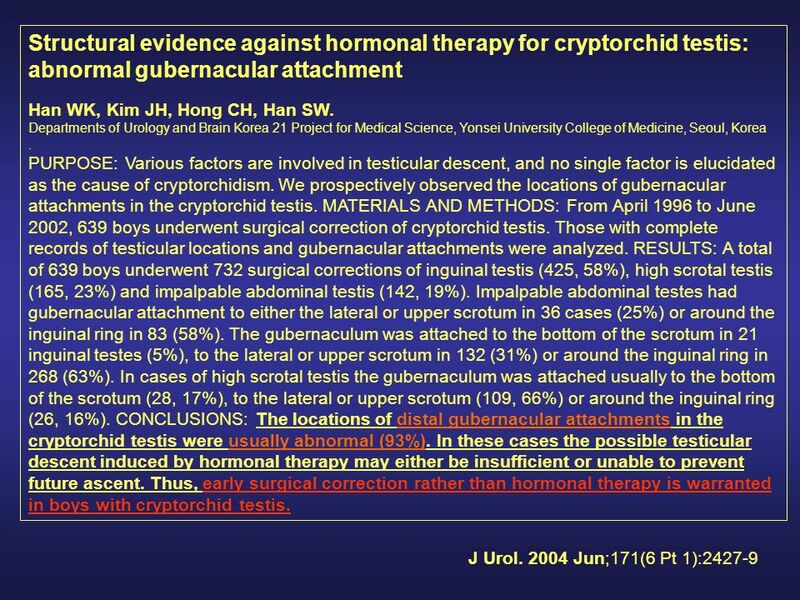 2004 Jun;171(6 Pt 1):2427-9 Structural evidence against hormonal therapy for cryptorchid testis: abnormal gubernacular attachment Han WK, Kim JH, Hong CH, Han SW. Departments of Urology and Brain Korea 21 Project for Medical Science, Yonsei University College of Medicine, Seoul, Korea. PURPOSE: Various factors are involved in testicular descent, and no single factor is elucidated as the cause of cryptorchidism. We prospectively observed the locations of gubernacular attachments in the cryptorchid testis. 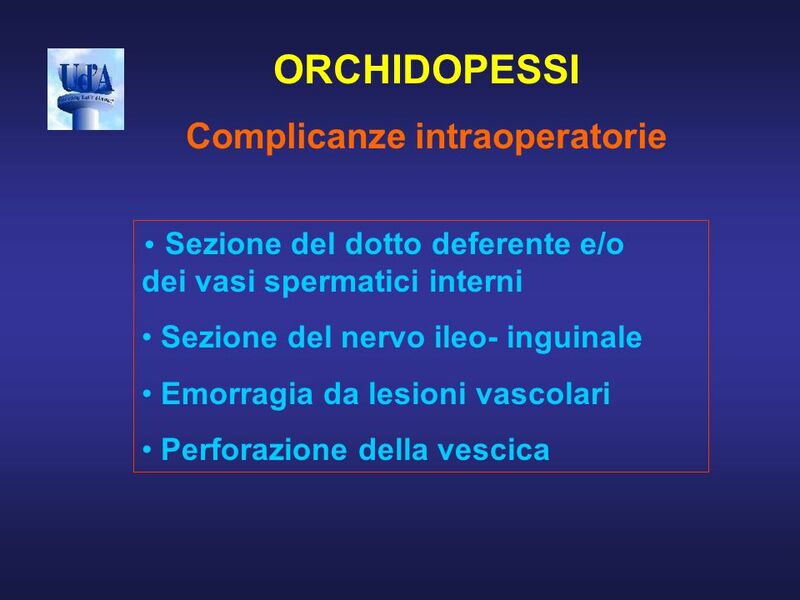 MATERIALS AND METHODS: From April 1996 to June 2002, 639 boys underwent surgical correction of cryptorchid testis. Those with complete records of testicular locations and gubernacular attachments were analyzed. RESULTS: A total of 639 boys underwent 732 surgical corrections of inguinal testis (425, 58%), high scrotal testis (165, 23%) and impalpable abdominal testis (142, 19%). 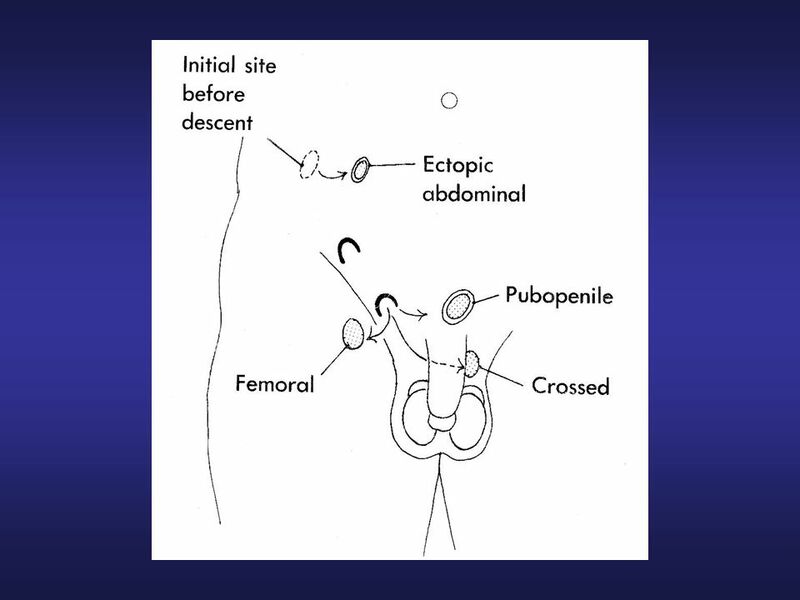 Impalpable abdominal testes had gubernacular attachment to either the lateral or upper scrotum in 36 cases (25%) or around the inguinal ring in 83 (58%). The gubernaculum was attached to the bottom of the scrotum in 21 inguinal testes (5%), to the lateral or upper scrotum in 132 (31%) or around the inguinal ring in 268 (63%). In cases of high scrotal testis the gubernaculum was attached usually to the bottom of the scrotum (28, 17%), to the lateral or upper scrotum (109, 66%) or around the inguinal ring (26, 16%). CONCLUSIONS: The locations of distal gubernacular attachments in the cryptorchid testis were usually abnormal (93%). In these cases the possible testicular descent induced by hormonal therapy may either be insufficient or unable to prevent future ascent. Thus, early surgical correction rather than hormonal therapy is warranted in boys with cryptorchid testis. 23 J Urol. 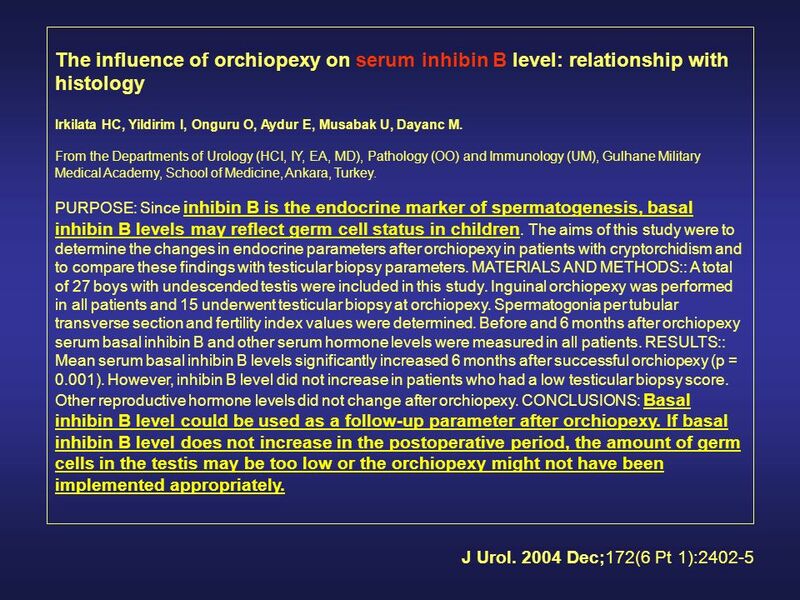 2004 Dec;172(6 Pt 1):2402-5 The influence of orchiopexy on serum inhibin B level: relationship with histology Irkilata HC, Yildirim I, Onguru O, Aydur E, Musabak U, Dayanc M. From the Departments of Urology (HCI, IY, EA, MD), Pathology (OO) and Immunology (UM), Gulhane Military Medical Academy, School of Medicine, Ankara, Turkey. PURPOSE: Since inhibin B is the endocrine marker of spermatogenesis, basal inhibin B levels may reflect germ cell status in children. 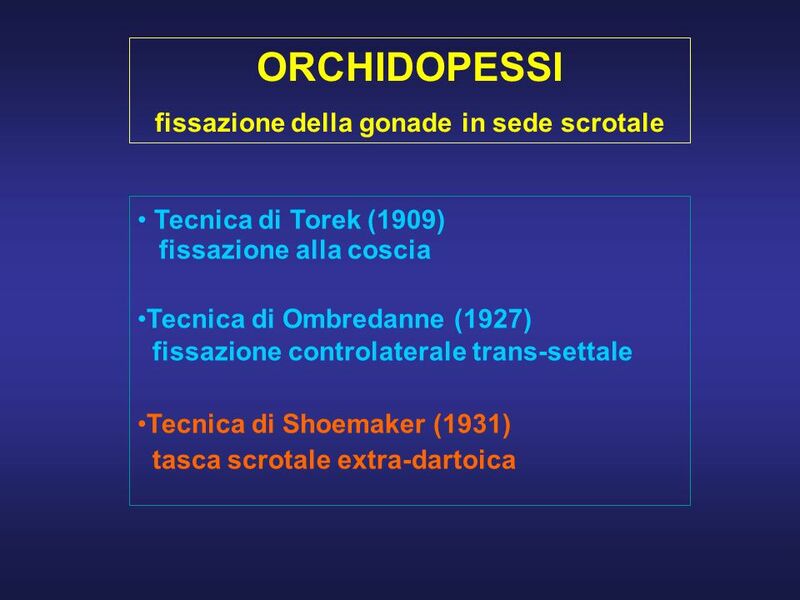 The aims of this study were to determine the changes in endocrine parameters after orchiopexy in patients with cryptorchidism and to compare these findings with testicular biopsy parameters. MATERIALS AND METHODS:: A total of 27 boys with undescended testis were included in this study. 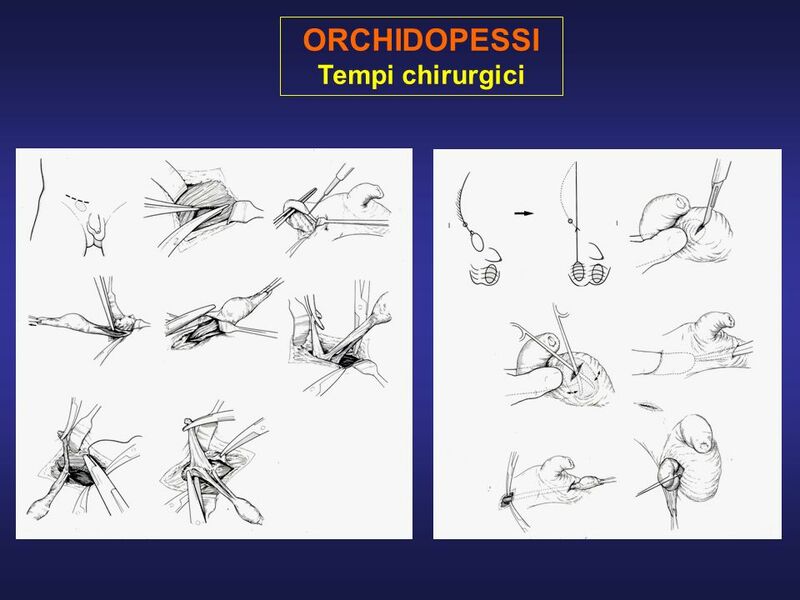 Inguinal orchiopexy was performed in all patients and 15 underwent testicular biopsy at orchiopexy. Spermatogonia per tubular transverse section and fertility index values were determined. Before and 6 months after orchiopexy serum basal inhibin B and other serum hormone levels were measured in all patients. RESULTS:: Mean serum basal inhibin B levels significantly increased 6 months after successful orchiopexy (p = 0.001). However, inhibin B level did not increase in patients who had a low testicular biopsy score. 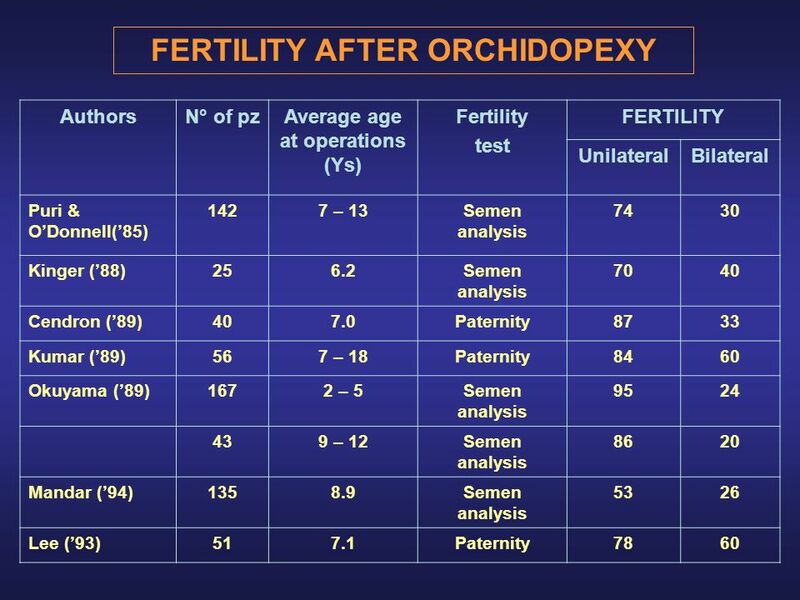 Other reproductive hormone levels did not change after orchiopexy. CONCLUSIONS: Basal inhibin B level could be used as a follow-up parameter after orchiopexy. If basal inhibin B level does not increase in the postoperative period, the amount of germ cells in the testis may be too low or the orchiopexy might not have been implemented appropriately. 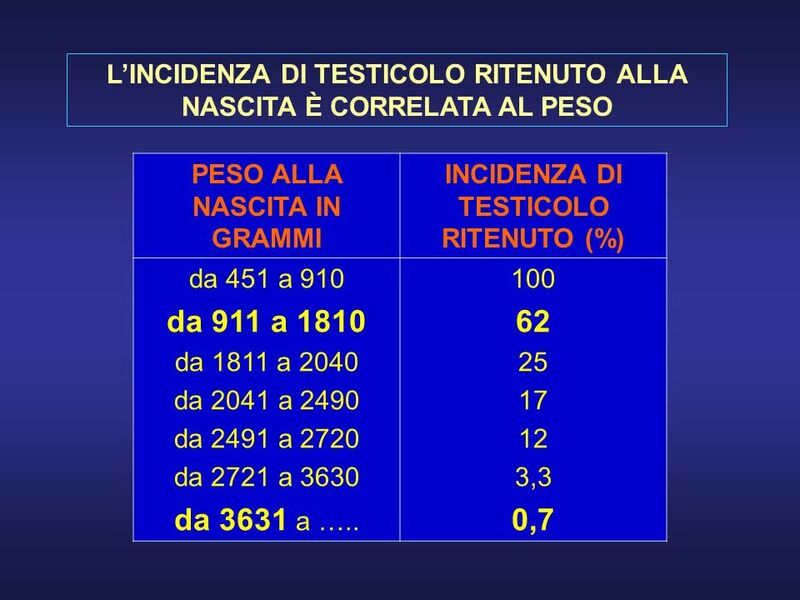 24 RITENZIONE TESTICOLARE TRATTAMENTO A CHE ETA ? 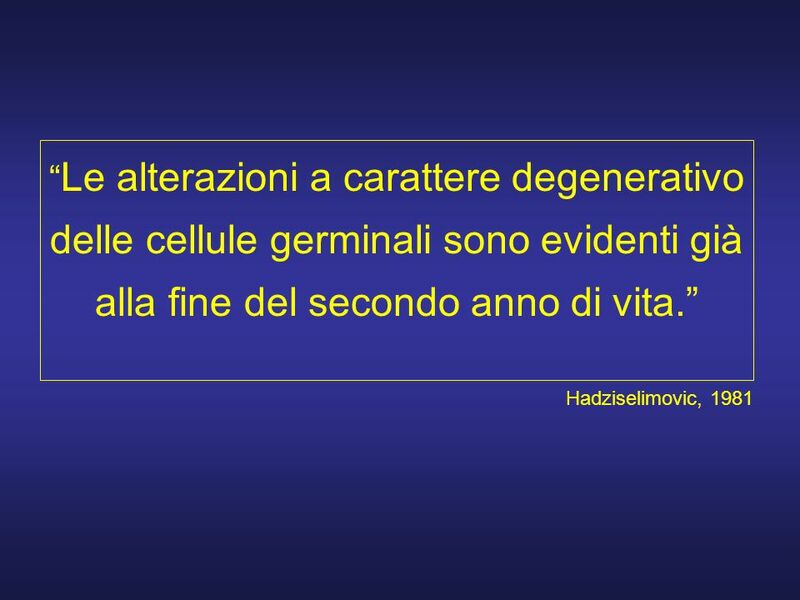 27 Letà ottimale per la terapia del testicolo ritenuto (terapia ormonale o orchidopessi) va individuata tra il primo ed il secondo compleanno. 28 Adv Pediatr. 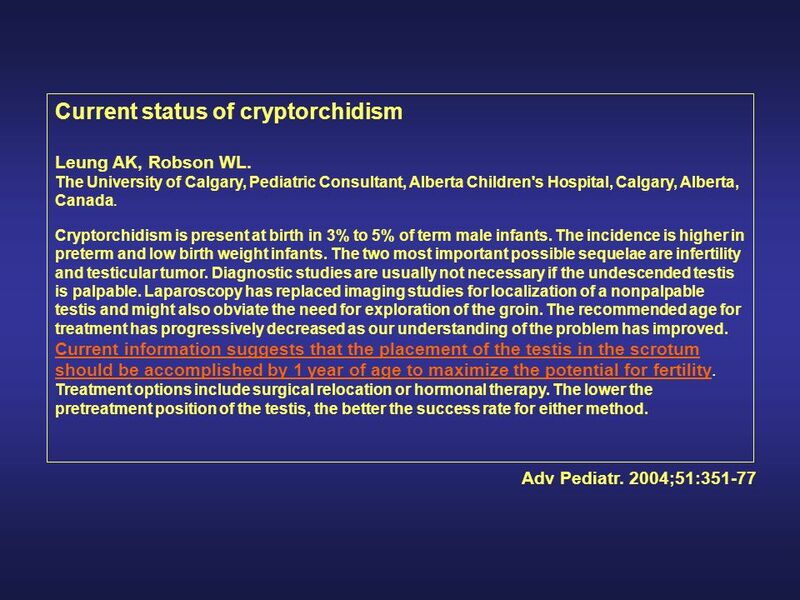 2004;51:351-77 Current status of cryptorchidism Leung AK, Robson WL. The University of Calgary, Pediatric Consultant, Alberta Children's Hospital, Calgary, Alberta, Canada. 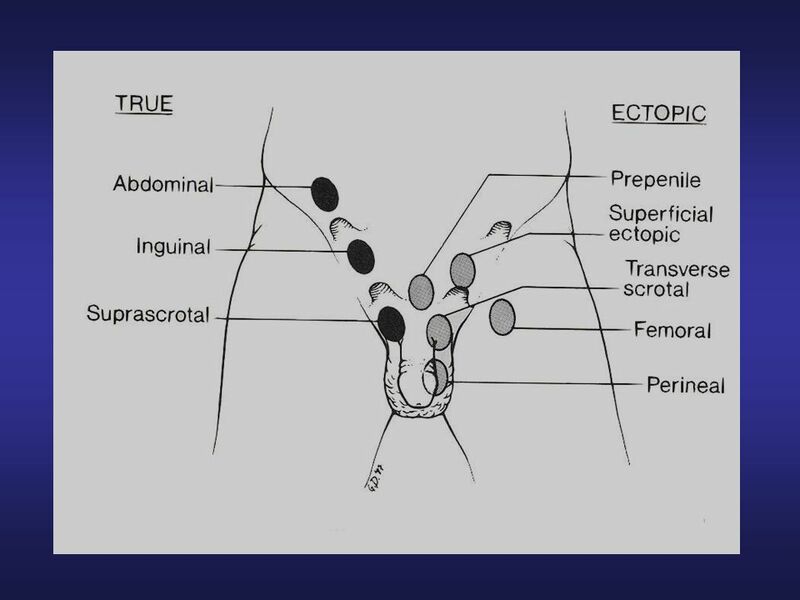 Cryptorchidism is present at birth in 3% to 5% of term male infants. The incidence is higher in preterm and low birth weight infants. The two most important possible sequelae are infertility and testicular tumor. Diagnostic studies are usually not necessary if the undescended testis is palpable. Laparoscopy has replaced imaging studies for localization of a nonpalpable testis and might also obviate the need for exploration of the groin. The recommended age for treatment has progressively decreased as our understanding of the problem has improved. Current information suggests that the placement of the testis in the scrotum should be accomplished by 1 year of age to maximize the potential for fertility. Treatment options include surgical relocation or hormonal therapy. The lower the pretreatment position of the testis, the better the success rate for either method. 31 Fertil Steril. 2004 Nov;82(5):1463-5 Etiology of azoospermia in 100 consecutive nonvasectomized men Fedder J, Cruger D, Oestergaard B, Petersen GB. 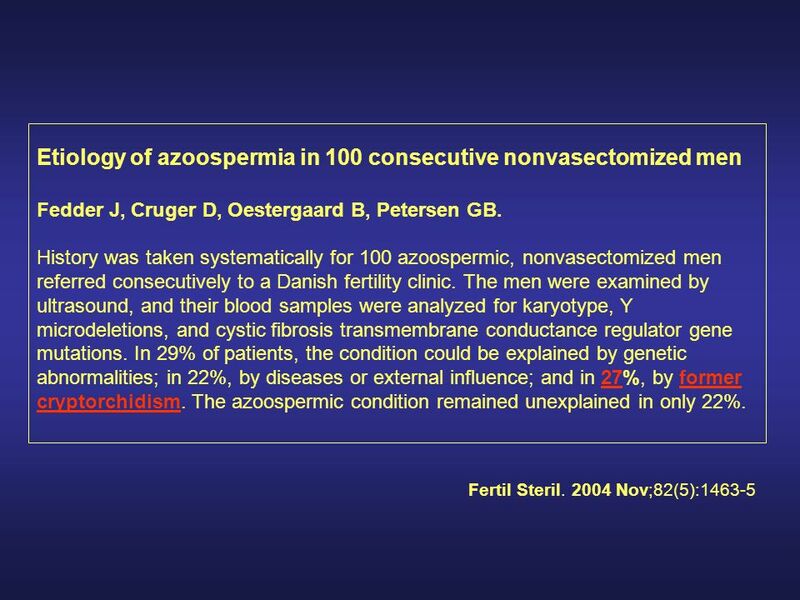 History was taken systematically for 100 azoospermic, nonvasectomized men referred consecutively to a Danish fertility clinic. The men were examined by ultrasound, and their blood samples were analyzed for karyotype, Y microdeletions, and cystic fibrosis transmembrane conductance regulator gene mutations. In 29% of patients, the condition could be explained by genetic abnormalities; in 22%, by diseases or external influence; and in 27%, by former cryptorchidism. The azoospermic condition remained unexplained in only 22%. 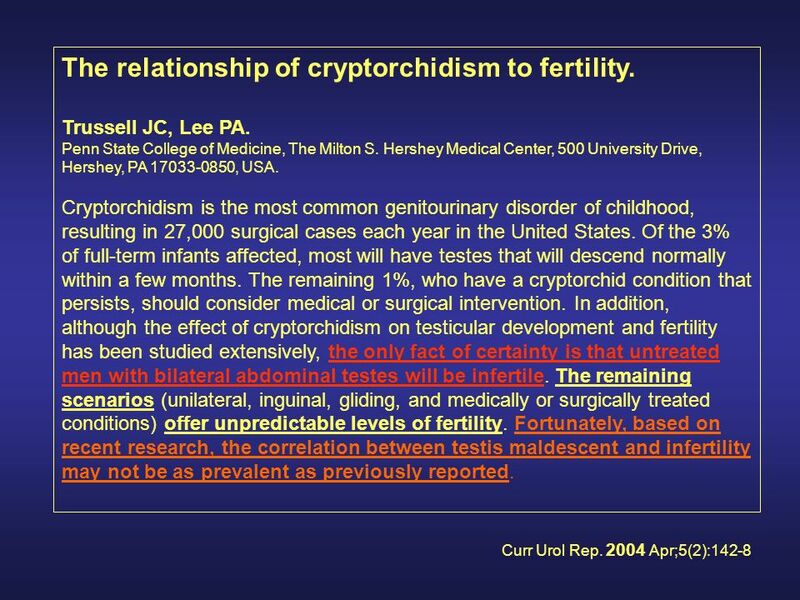 32 Curr Urol Rep. 2004 Apr;5(2):142-8 The relationship of cryptorchidism to fertility. Trussell JC, Lee PA. Penn State College of Medicine, The Milton S. Hershey Medical Center, 500 University Drive, Hershey, PA 17033-0850, USA. 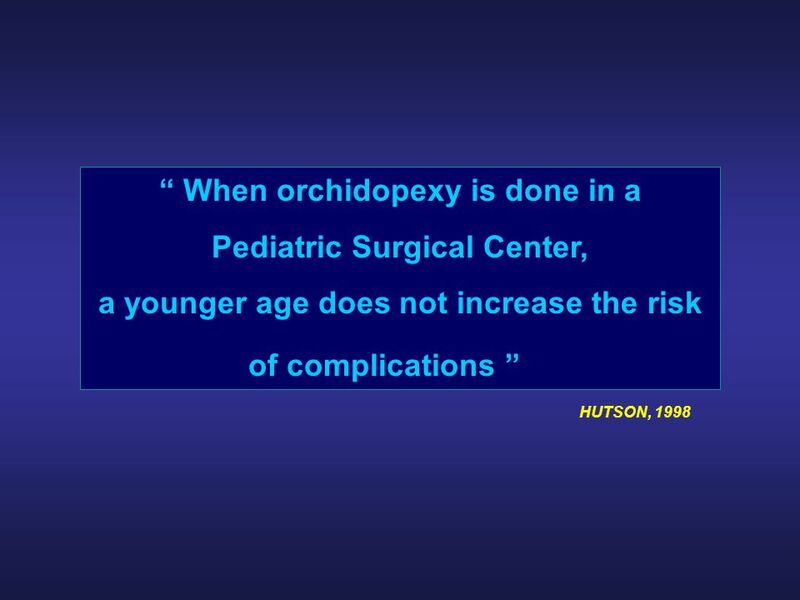 Cryptorchidism is the most common genitourinary disorder of childhood, resulting in 27,000 surgical cases each year in the United States. Of the 3% of full-term infants affected, most will have testes that will descend normally within a few months. The remaining 1%, who have a cryptorchid condition that persists, should consider medical or surgical intervention. In addition, although the effect of cryptorchidism on testicular development and fertility has been studied extensively, the only fact of certainty is that untreated men with bilateral abdominal testes will be infertile. The remaining scenarios (unilateral, inguinal, gliding, and medically or surgically treated conditions) offer unpredictable levels of fertility. Fortunately, based on recent research, the correlation between testis maldescent and infertility may not be as prevalent as previously reported. 38 GRAZIE PER LA VOSTRA ATTENZIONE ! 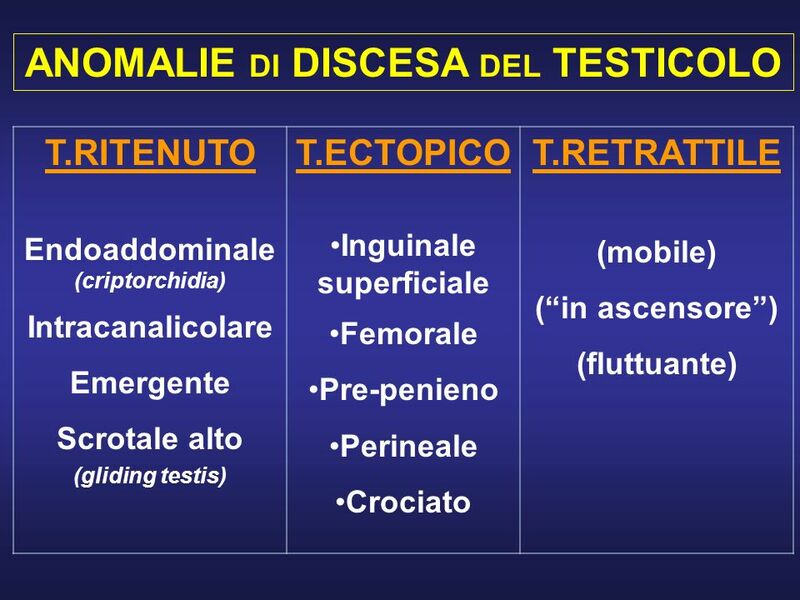 Scaricare ppt "Lanciano 25.11.2006 ANOMALIE DI DISCESA DEL TESTICOLO TESTICOLO CATTEDRA DI CHIRURGIA PEDIATRICA UNIVERSITA DEGLI STUDI G. DANNUNZIO CHIETI-PESCARA N."
TIPOLOGIA DELLE VARIABILI SPERIMENTALI: Variabili nominali Variabili quantali Variabili semi-quantitative Variabili quantitative.